Here's a great arts integration lesson plan for teaching writing with Kandinsky. Here's another idea for analyzing this work with students. This would be my second favorite method to use with this work of art. It is called Puzzle. This strategy is from my eBook called Strategies for Looking at Art with Students. Cut a print of artwork into pieces. Make sure each piece has a significant piece of the artwork showing. Give each group one piece. Ask the students to study their pieces and describe what they see to the other groups. You can either have them memorize what is shown in their piece and describe it without looking OR have them look at the piece as they describe what they see. Have students assemble the pieces to show the full work of art as if putting together a puzzle. Have students follow these steps to create their own concentric circles in squares. Cut a large sheet of tagboard in half vertically. Fold one half into three squares. Draw concentric circles in each square. The first square should have five circles. The second square should have seven circles. The third square should have five circles. This corresponds to the syllables in a haiku. 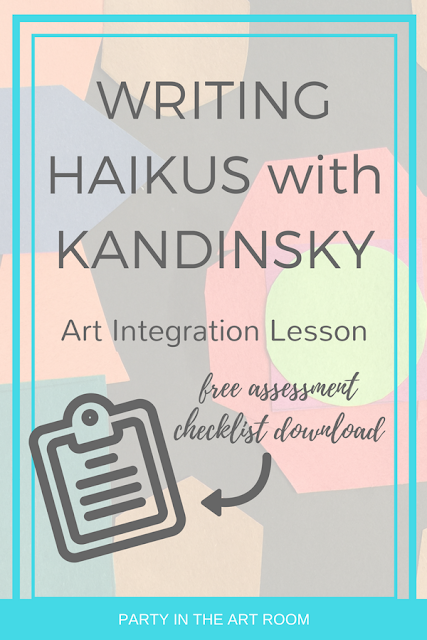 Have students compose a haiku using the color scheme from their artwork as a guide for writing. Let's use the following image, cropped from Kandinsky's work, as an example. which refers to the colors of the berries used (red for raspberries or strawberries, blue for blueberries, yellow for yellow grapes). This is a really interesting concept. I’ve never thought about mixing art and writing like this. Thank you for presenting such a rigorous activity for kids.